MADRID --- The Council of Ministers plans to approve [today] three weapons programs for a total cost of 7,331 million euros, according to defense sources. This involves the construction of five F-110 frigates between 2019 and 2032 for 4,325 million euros; the acquisition of 348 8x8 vehicles for the Army, to be delivered by 2025, for 2,100 million euros; and for the update of the Eurofighter combat aircraft for 906 million euros. If these programs are added to those already approved since the arrival of Pedro Sánchez as Prime Minister – additional cost of S-80 submarines (€1,172 million), communications satellites (€1,397 million), modernization of Chinook helicopters (€819 million) and purchase of helicopters NH-90 (€1,381 million) - the total cost amounts to 12,100 million euros. What will be approved today by the Council of Ministers are the expenditure ceilings for these programs but not the contracts themselves, which should be awarded next year. These projects have a strong impact on employment, especially the F-110 frigates, which will generate almost 7,000 jobs during nine years, 3,300 of them direct, especially in Galicia. 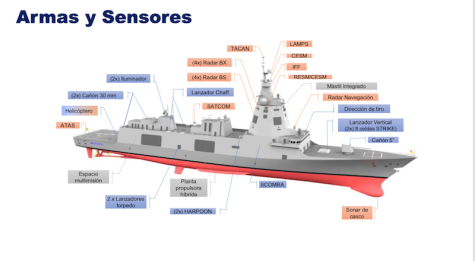 The F-110, in whose technology programs Spain has already invested 174 million euros, are multi-mission ocean-going escorts that will replace the six frigates of the Santa María class, which have over 30 years of service. One of its main novelties is the incorporation of an integrated mast with sensors and antennas. The launch of the program was pending the decision of the anti-aircraft defense system; between the British Sea Ceptor and the American ESSM Block 2. Last August, Defense settled the dispute in favor of the second, after verifying the very high cost of integrating the European missile into the Aegis combat system and the limitations of access to information and intellectual property. The Navy always opted for the Sea Sparrow (ESSM), in service on several of its ships, but the former Defense team declared the European option "priority" and commissioned a 9.5 million-euro viability study from the MDBA company, manufacturer of the Sea Ceptor. As for the VCR 8x8, known as “Dragon” by the Army, it will be the new wheeled armored vehicle that will replace the old BMR, which had to be removed from Afghanistan or Iraq for their lack of safety. Today, the cabinet will approve only the first phase of a program that, in total, is expected to include 998 vehicles and cost 3,836 million euros. The Government has already invested 92 million in the technological programs of the Dragon, awarded to a UTE (Temporary joint venture) integrated by Santa Bárbara Sistemas, Indra and SAPA. The delivery of the five technological demonstrators was scheduled for last November, but has been postponed until July 2019, after the Army requested a sixth prototype to test mobility (engine and transmissions), incorporated a weapon station of national manufacture and decided the destruction of two of the vehicles to evaluate their resistance against mines and explosives. The impact of the program on employment will be especially important in Alcalá de Guadaira (Seville), Trubia (Asturias), Aranjuez (Madrid) and Andoain (Gipuzkoa). Finally, the update of the Eurofighter aims to prevent Spanish aircraft from being outdated in relation to the other project partners (United Kingdom, Italy and Germany). With this increase, the total cost for Spain of the European fighter aircraft will rise to 10,160 million euros.